Meet some of the holy troublemakers featured in the book. Maryam Molkara was a devout Muslim and a transgender woman from Iran. She endured many injustices because of her gender identity, including imprisonment, physical assault, and being forced to take male hormones after the revolution. One day in 1987, she literally walked into Ayatollah Khomeini’s office to ask for the religious and legal right to live as a woman. She got it (after being beaten by his guards), and Iran today still has more rights for transgender people than other similar countries thanks to her. Bayard Rustin is the Civil Rights hero most people don't know about. He was a key advisor to Dr. Martin Luther King, Jr., and helped convince Dr. King to fully embrace non-violent resistance as an ideology. Bayard was the chief organizer of the March on Washington in 1963 where Dr. King delivered his “I Have a Dream” speech. However, Bayard was also a gay man in an era when that was considered a liability (not to mention a crime), so he had to stay in the background. Bayard credited his Quaker faith for his activism and his firm conviction that all people are equal and part of one human family. 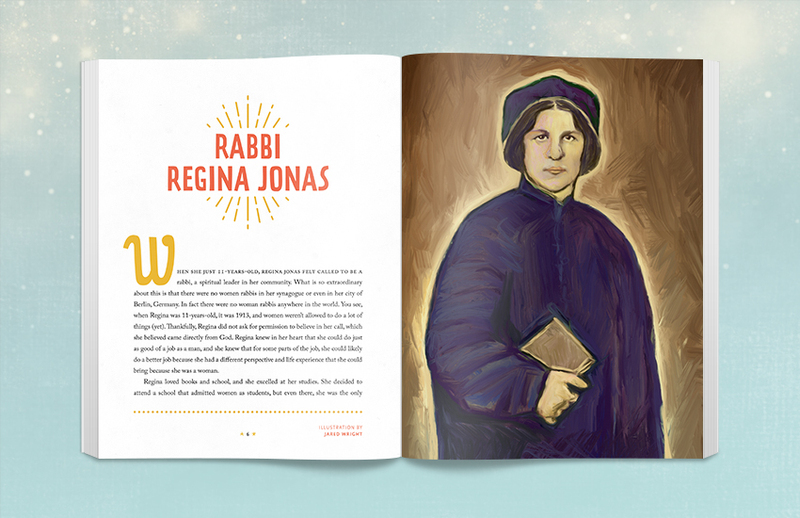 Rabbi Regina Jonas was the first woman ordained as a Rabbi in 1935 in Berlin, Germany. She wrote her thesis on whether or not women could be rabbis according to sacred Jewish texts and religious laws, and helped set up a secret synagogue at Theresienstadt, the concentration camp where she had been taken in 1942. She served as a rabbi amid the horrific conditions of that camp for two years, serving the spiritual needs of her community through some of the darkest times in human history. Sadly, she was killed at Auschwitz and her papers lost until after the fall of the Berlin Wall, so her story and trailblazing work is being rediscovered today. Alice Paul was also Quaker (like Bayard Rustin) and an American suffragette and major force behind women’s rights and equality. She employed more radical protest tactics than had previously been used, knowing that polite conversation would not result in women having the right to vote. She believed resisting tyranny was an act of obedience to God. She was arrested for protesting outside of the White House (President Woodrow Wilson objected to her “unladylike” tactics), and led a hunger strike in prison, ultimately helping move the tide of support in favor of women having the right to vote. She devoted her life to the ongoing effort for women to have full equality, an effort still underway today by her successors in advocacy. Cindy Wang Brandt is an author and speaker known for her work helping parents who are “raising children unfundamentalist”. She grew up in Taiwan and converted to evangelicalism as an elementary student and knows how damaging it can be to view children and parenting through the lens of original sin, which often leads to authoritarian parenting and damaged relationships and shamed children. She recently got fired from her job at an evangelical college in Taiwan because of her outspoken advocacy for the full rights of LGBT people, but with a transgender sibling, she is more than willing to pay this price for her advocacy. She is one of our modern-day holy troublemakers and unconventional saints. St. Francis of Assisi is one of the few people being featured in Holy Troublemakers & Unconventional Saints who is already well-known, but most people don’t know how radical and counter-cultural his work was. In addition to his deep love of all life, including birds and animals, he believed deeply in following the path of Jesus, which for him meant working for the poor and marginalized. He even went to meet with the Sultan of Egypt during the 5th Crusade in the hope of ending the violence between Christians and Muslims. The order he founded, the Franciscans, still work on behalf of the environment, animal rights, and the poor. Holy Troublemakers and Unconventional Saints is an illustrated children’s storybook featuring the stories of 50 people of faith who worked for more love and justice in their corner of the world, even when that meant rocking the religious boat. These are people from different religions and time periods who spoke truth to power and did the right thing, even when it was the hard thing. These are not perfect people, but they are people we can glimpse the holy through. This book will be illustrated with a variety of artistic styles and will emphasize the stories of women, LGBTQ people, people of color, indigenous people, and others often written out of religious narratives. There’s a growing community of progressive families of faith as well as grandparents, godparents, aunts, uncles, and teachers who want better faith-based content for kids. These are the faith heroes we want our children inspired by. These are the holy troublemakers and unconventional saints whose portraits and profiles we want on our children's bedside tables. Join our newsletter list and we’ll keep you updated on the progress of the book. Thank you for signing up! Check your email for more details. Brought to you by the producer of the Seventh-Gay Adventists documentary and Outspoken short documentary film series.